It wasn’t long after Elizabeth Simcoe made her observations that the marsh began to change. Pollution and sewage from the Town of York emptied into the Lower Don River. Mills built along the river bank created physical barriers to fish migration, driving out the native salmon population. By the end of the 19th century, the lush aquatic ecosystem of the marsh had deteriorated completely. 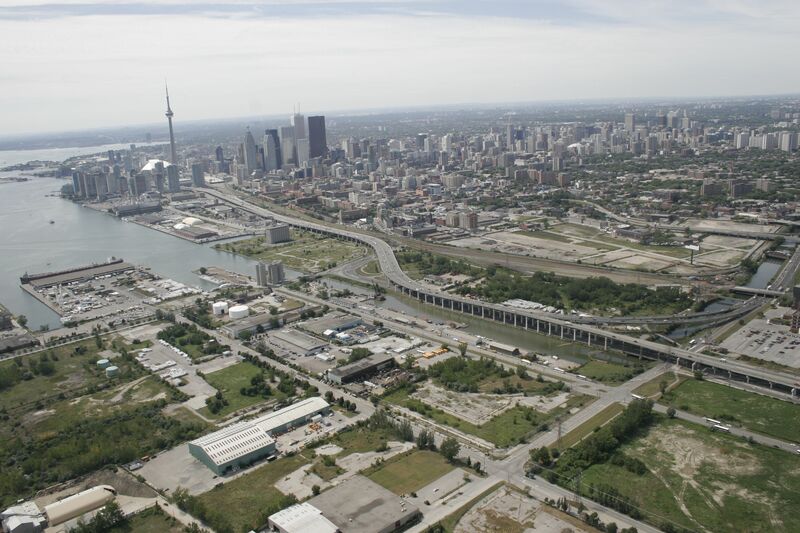 A view of the Port Lands showing the Keating Channel, where the Don River currently empties into the inner harbour. Starting in the 1870s, human-made interventions to the shoreline and marsh began with the construction of a series of breakwaters. The Keating Channel was built along the northern edge of the marsh in the late 1890s. As part of this transformation, the mouth of the Don River was redirected into the concrete lining of the Keating Channel. This sent the river out into the inner harbour through an unnatural 90-degree turn, increasing the risk of flooding in the Port Lands. In 1912, the Board of the Toronto Harbour Commission completed a plan to transform Ashbridges Bay Marsh into a massive industrial district. By 1922, the marsh had been filled in to create more than 200 hectares of land, with another 200 hectares soon to follow. Starting in the 1950s, a second wave of development began. The Leslie Spit was built, as well as the Hearn Generating Station and the Commissioners Incinerator. The Gardiner Expressway was built in the 1950s over the mouth of the Don River. The opening of the St. Lawrence Seaway ignited a renewed effort to turn the Port Lands into a major shipping hub and industrial district. These aspirations never materialized and by the 1980s, the Port Lands remained underutilized. The area had become home primarily to civic and city-serving uses such as salt storage, as well as light industrial uses. In the early 2000s, several film production studios were built in the area. Today, the Port Lands is only a 15-minute bike ride from the downtown core. Cherry Beach, the Leslie Spit and Tommy Thompson Park make it a popular destination for cyclists and nature lovers. Despite being the home to manufacturing, recreational, heavy industry, cultural, media and creative industry, retail and port uses, most of this 400-hectare area is still largely underused. Over the past three decades public support for the re-naturalization of the Don River mouth has grown stronger. Today, that vision for the Port Lands is becoming a reality. Learn more about what we’re building as part of the revitalization of this area.